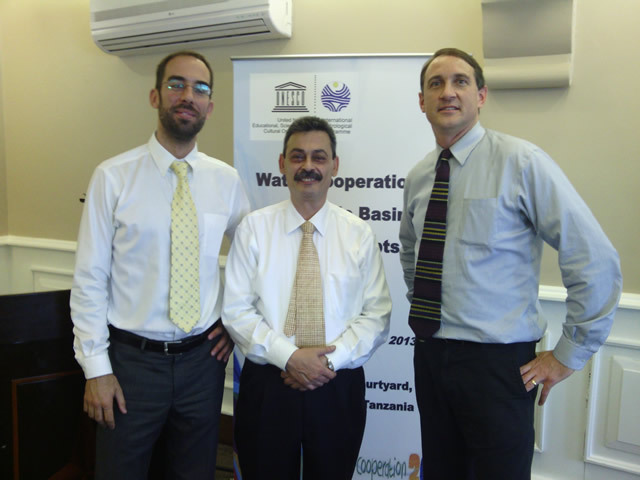 International Center for Integrated Water Resources Management (ICIWaRM), under the auspices of UNESCO, team at the “Water Cooperation in the Nile Basin-from Concepts to Action” workshop. 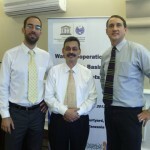 Pictured left to right: Dr. Aleix Serrat Capdevila, Research Professor at ICIWaRM partner University of Arizona; Dr. Bisher Iman, Deputy Secretary of UNESCO’s International Hydrological Programme; Dr. Hal Cardwell, Director Conflict Resolution and Public Participation Center of Expertise at the USACE Institute for Water Resources. The Water Cooperation workshop was hosted by UNESCO’s International Hydrologic Programme (IHP) and featured plenary presentations, panel discussions and intensive work sessions as technical experts from nine of the Nile Basin countries developed a road map and action plan to support integrated water resources management and promote climate change adaptation. The workshop took place December 3-6, 2013, in Dar Es Salaam, Tanzania. Dr. Hal Cardwell, Director of the U.S. Army Corps of Engineers’ Conflict Resolution and Public Participation Center of Expertise, presented on “Collaborative Modeling as a Tool to Implement Integrated Water Resources Management.” Dr. Cardwell also facilitated the working group that developed a road map for integrated water resources management for the Nile. Dr. Aleix Serrat Capdevila, Research Professor at ICIWaRM partner University of Arizona, presented on “Remote Sensing for Climate Change Analysis and Adaptation.” Dr. Capdevila facilitated the working group that developed a road map for Climate Change Adaptation for the Nile. The basis for the many of the ideas presented at the workshop was ICIWaRM’s recent work on Using Scenarios in Shared Vision Planning in the Mekong basin and in Mongolia. Workshops by USACE in coordination with the U.S. Agency for International Development, focus on a bottom-up, collaborative approach to incorporating climate change in water resources planning and has been well-received in multiple locations. Dr. Bisher Iman of UNESCO’s IHP program was the overall lead for the workshop. The ICIWaRM team provided Dr. Iman workshop design support. Going forward UNESCO will refine the road map and action plan that was developed at the workshop and seek funding for associated projects ideas. Dr. Bisher Iman of UNESCO’s International Hydrological Programme organized the workshop and expressed his appreciation for the ICIWaRM team’s workshop support, as well as for the results achieved by the technical experts who developed the road map and action plan.